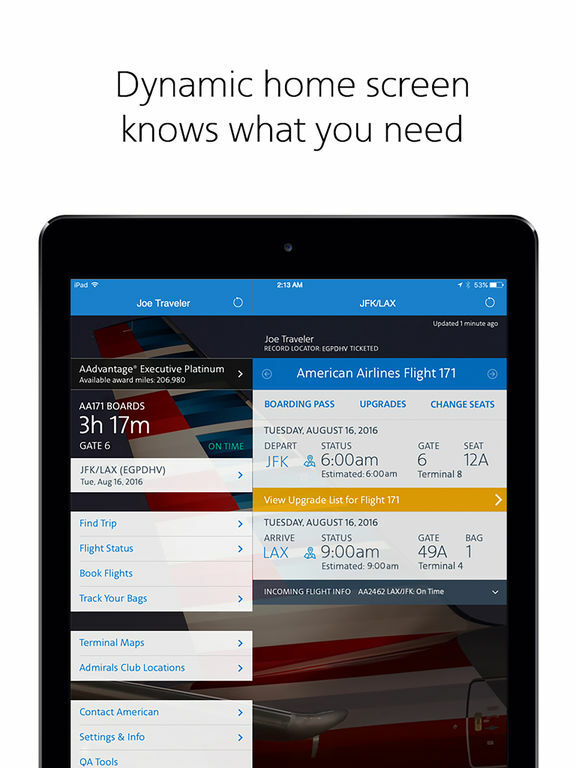 With the American Airlines app, you’re covered with the information you need exactly when you need it. Curious about traffic to the airport? Need a mobile boarding pass? Wondering where the closest Admirals Club® lounge is located? All of this info, and more, is available at your fingertips. - Dynamic home screen: Knows where you are in your travel journey and gives you easy access to the right tools at the right time. - Mobile boarding pass: Check in for your trip and retrieve your mobile boarding pass. No need to print, and it’s updated along the way. - Flight updates: Get the latest flight updates by simply retrieving your reservation and allowing American Airlines to send notifications to your mobile device. 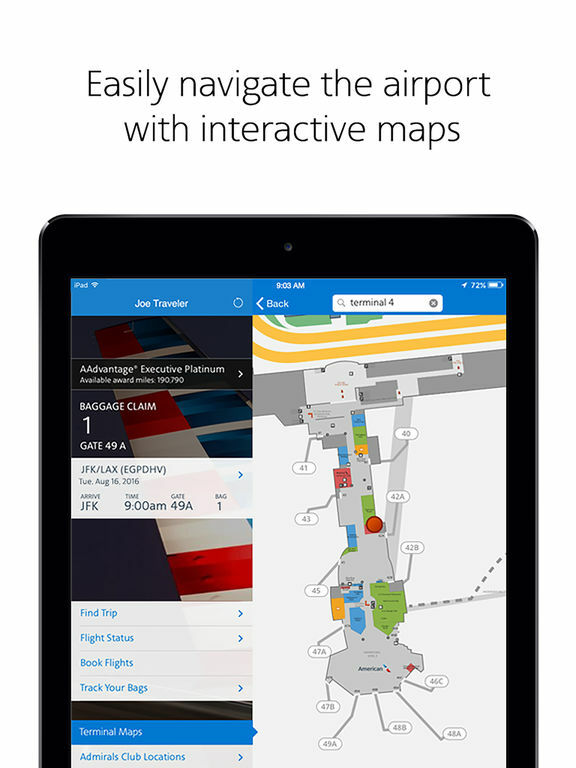 - Interactive terminal maps: Navigating airports is a breeze with our interactive terminal maps. Find the closest Admirals Club lounge or get directions to your connecting gate. - AAdvantage® account details: Review all the details of your AAdvantage account right from the app. Not an AAdvantage member? Sign up today. - Upgrade your seat: Request and purchase upgrades with ease. Want to see where you are on the list? The app displays the upgrade standby list within four hours of your scheduled departure. 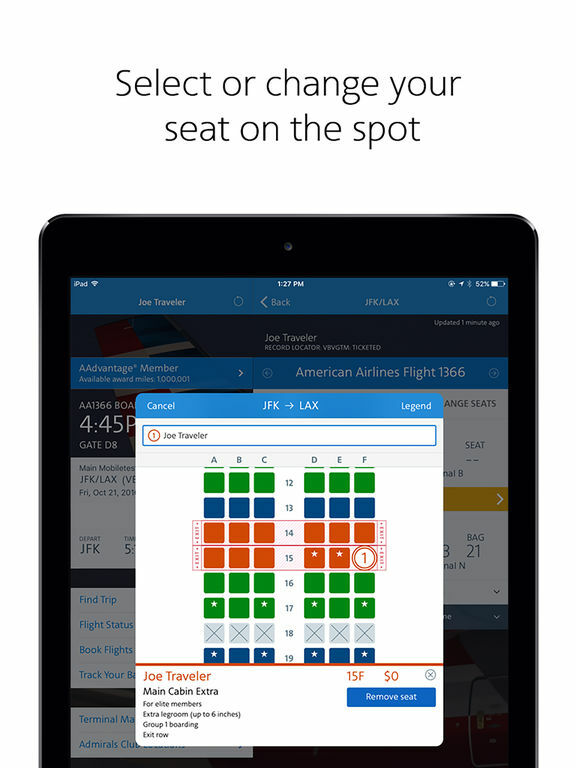 - Seat selection: Select or change your seat within the app. Just pick the one you’d like and change it on the spot. - Track your bag: Know exactly where your bag is from the time it leaves your hands to when you extend the handle at your final destination. - Save your reservation: Your recently viewed reservations are automatically saved in the app so you can easily grab the details for your next flight in seconds. - Quick interactions: The American app utilizes 3D touch and is Apple watch compatible, giving you quick access to the most important info. - Wi-Fi access in the air: Don’t forget on flights with Wi-Fi, you can use the American app and aa.com at no cost. There’s a new group of flyers out there – The World’s Greatest Flyers. They know that having the right travel tools contributes to a great experience. New with iOS10, the sky’s the limit with the American Airlines sticker pack! Let friends and family know that you’re traveling, headed to the Admirals Club® lounge to take it easy before taking off, snapping photos at 30,000 feet or that you’ve arrived. - Logged in users have the ability to purchase seats and certain upgrade options by entering a credit card within the app. There is still the option to purchase with the stored credit card in your AAdvantage profile. · Additional upgrade opportunities available for purchase if a credit card is stored in your AAdvantage profile. To store a credit card, simply go to aa.com and update your Reservation Preferences in your AAdvantage profile. -	3.0.2 addresses issues for some 3.0.0 or 3.0.1 users who continuously saw message "Retrieving Reservations..." or were continuously asked to enter their password. • You can now login with the e-mail address associated with your AAdvantage account. NOTICE: Due to performance issues, older versions of the app are no longer supported. Please update to the latest app 2.3.1. 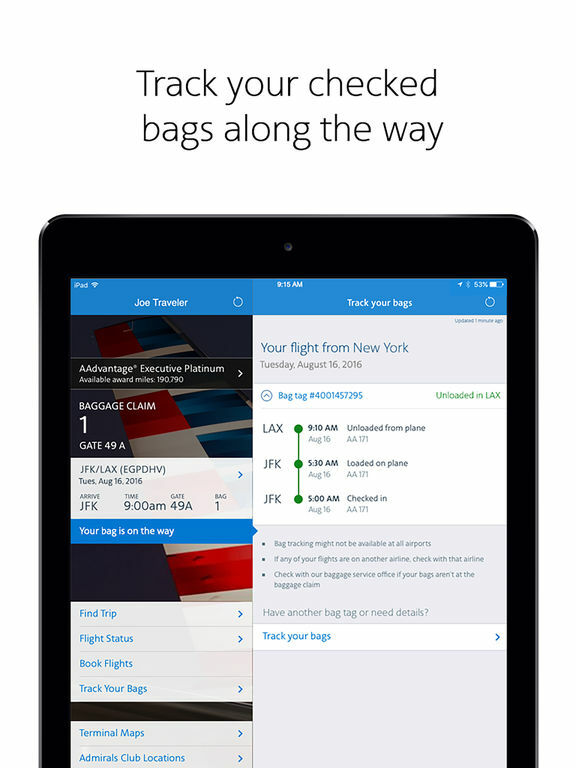 - All AAdvantage members can now log-in to the app and select or change their seat - even after check-in! - AAdvantage members that want to purchase a seat can do that too with the credit card they have stored in their AAdvantage profile. To store a credit card, simply go to AA.com and update your Reservation Preferences on your AAdvantage profile. For Passbook users, you can add your mobile boarding pass to Passbook and it will automatically appear on your lock screen as you get closer to your departure time. You can find out additional details about your flight by selecting the information button on the front of your pass in Passbook. This information button will display your record locator, departure date, duration of the flight, and if wifi is available for your flight. 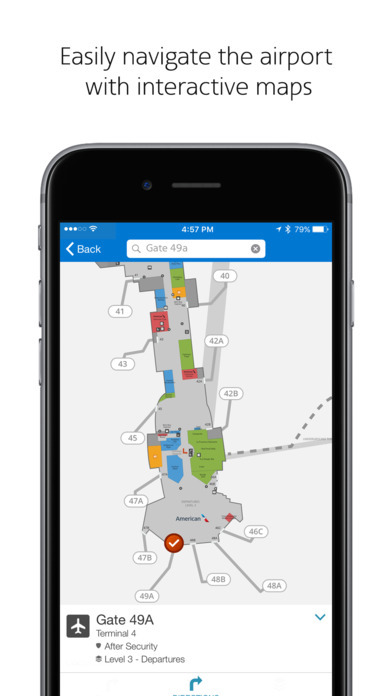 The pass will automatically update with flight details if flight status is checked in our app. For iOS 6 iPhone users, your American Airlines mobile boarding passes can now be added to the Passbook with this update! Note: iOS 5 Beta users might experience app crashes. We are working on a fix! This update currently only works on OS 4. I honestly love this app. I wanted my boarding pass to be in my passbook and that's exactly what it did. All flight info was displayed clearly & simply. Very satisfied. It worked no problem. I usually do not write reviews but this app deserves more than 1.5 stars. It worked for me. And it was so cool to use the app as my boarding pass. I travel constantly, sometimes flying AA/AE two, three times a week. I use this app almost everyday.